Apps in schools can make students more interactive and activate better engagement between teachers and students. As schools continue to realize the power tablets and smartphones hold for better learning in the classroom, apps has fast become one of the trends in education. From apps to support creative writing and collaboration, to flipped classroom and math classroom apps, this resource is the perfect tool to you make more informed decisions about the best apps to integrate in your classroom. Feeling overwhelmed trying to choose the right education apps to support what you’re doing in the classroom? 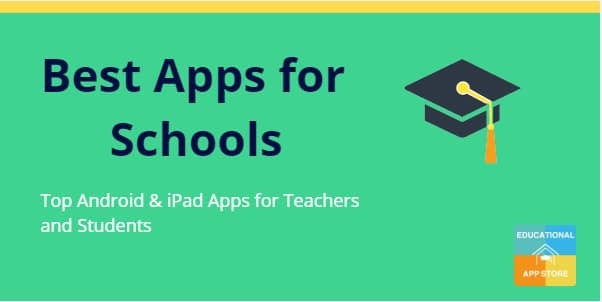 See below a list of apps for schools that can help teachers to engage with the students in the classroom. An amazingly easy-to-use digital bookmaking tool, this app is accessible even to kids in early elementary school grades to produce and publish their own simple books or comics with images, videos, and audio. Readers can access published books via iBooks or other online sources, or books can be printed on paper. Before creating that first book, it's helpful to read the basic tutorial. Socrative Teacher is an amazing app to use to assess students in your classroom. The ease of use of Socrative makes it so teachers can gather data and assess their students by simply pressing a button. The teacher app lets you create and run quizzes, general feedback and games. The nice part about Socrative is that exporting the data is a breeze! With the Quizlet app, students can search an online database of more than 13 million user-created flashcard sets on a wide variety of topics. This app is free, and the content varies from highly useful to useless. The app is for reviewing flashcards and students can use it to create their own sets of flashcards. Popplet app can be used to organise thoughts and ideas in visual form using diagrams, charts and mindmaps for elementary to high school students requiring a minimalist approach to presentations. Popplet is an excellent way for students to create graphic organizers to organize and share what they have learned! It is easy to use, allows the user to incorporate images and text, and can be exported to photos to be shared via a website. Memrise is a fun and efficient memorisation tool for the classroom and beyond. It uses some creative and easy way to remember words for learning English. The focus of this app is to	help the users expand their vocabulary by learning English words in an effective way. Memrise is being used so imaginatively and effectively to teach subjects outside the realm of language vocabulary. iMovie is an app that can be used across all age groups in schools. Teachers can also use iMovie as a tool for introducing content in a meaningful way. The presentations created by iMovie are highly distinguished and are ideal for classroom teaching. Both teachers and students can use iMovie to document and record events outside of the school and that has relevance to the units being taught in the classroom. Students can use iMovie to tell stories using digital media including pictures, images, and music. This can improve their verbal fluency and their communicative skills. Comic Life is an excellent complement to their lesson plans for beginning and intermediate readers and writers. Comic Life is perfect for engaging reluctant readers and teaching visual literacy, perfect for integrating STEAM and Common Core Standards into your lessons. Easy to learn and fun to use, Comic Life is a great tool for any student. Mathletics is the world’s leading educational resource for mathematics, created by the team behind the World Education Games. Over 4 million students in schools across the world are a part of our global learning community. Many schools have introduced their students to the competitive thrills provided by Mathletics. If your child’s school is not one of these, you can still let them experience learning and practising maths by competing against children from all over the world. Bee-Bot is the perfect app to teach young children control, directional language and programming. Bee-Bot can remember up to 40 commands and so encourages increasingly sophisticated plans and programs. Children love to teach Bee-Bot how to go from place to place and learn to plan, count and tell left from right as they do. It is equally adaptable to both home learning and school classroom environments and boosts enthusiasm for experimentation and learning wherever it is used. Mostly, teachers can use Edmodo as an online blackboard and inbox. They can post polls, quizzes, and assignment guidelines, and invite students to submit finished assignments. There are various ways to use Edmodo as teacher including to communicate with your students when you’re out of the classroom, or provide updates to students who are absent from class , facilitate project based learning in your classroom by leveraging Edmodo’s small-group feature. Notability is one of the most versatile apps available for notes taking. You can type or write notes on notebooks and organize them into folders inside the app. However, it also lets you annotate PDFs, which can be great for grading student papers. Notability also records audio and lets you take notes at the same time. So, you could be having a reading conference with a student, or testing their reading fluency with the audio recorder, while taking notes at the same time on your iPad. One of the primary reasons is because of the workflows that teachers and students can create in order to retrieve, annotate and submit work. Showbie is an assignment submission and grading tool for desktop and mobile devices, tuned to flipped and one-to-one computing classrooms. With both its free and paid versions, teachers can create assignments and share them with students, and students can submit responses from a desktop or mobile device. Teachers can offer written feedback ( by drawing or typing) and they can also record audio to give verbal feedback. Notably, Showbie lets students submit assignments from many iPad apps, including apps where students write, draw, develop presentations, and make movies. The paid version of the app has significantly more features, including a gradebook tool, a student portfolio, and additional features for fostering discussion among students and with parents. ClassDojo is a consistent and very structured classroom management tool designed to help teachers improve student behavior and communicate more effectively with parents. It can be used to a small or large extent depending on your time, purpose, and interest. As part of the behavior management system. the students receive points for specific behaviors (On-task, working hard, persistence, etc.) and receive negative points for negative behaviors such as being off-task, bullying, or blurting out.